Genealogy librarian, Sarah Ross Kelliher, started knitting as a child and has been an avid knitter and spinner for over 20 years. About a year ago she began sharing her skills with others at Centennial Library in Midland, Texas every Tuesday evening. What started out as a small cluster of two or three knitters has grown to more than a dozen yarn enthusiasts who come to the genealogy department of the library to share projects, learn new skills, and offer each other encouragement and assistance. 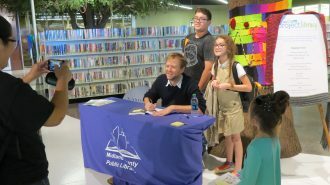 This October the Midland County Library Foundation joined with Wells Fargo and the Midland Reporter-Telegram newspaper to bring free books to all the first graders in Midland via an annual event named Project Literacy. Via Project Literacy, every first-grade student in Midland receives a hardback book to keep and enjoy. Three thousand copies of a title (including 300 copies of a Spanish translation) are delivered to all of the city’s public and private schools. 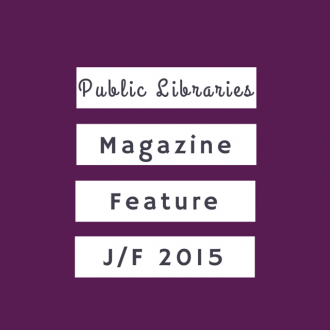 This year the featured title was Extra Yarn by Mac Barnett. The illustrations in the book won Jon Klassen, the book’s artist, a Caldecott Honor in 2013. The book is about Annabelle a little girl who discovers a box of multicolored yarn that never runs out. She knits colorful sweaters for everyone and everything, transforming her formerly drab village. An evil archduke sets out to steal her box of magical yarn. 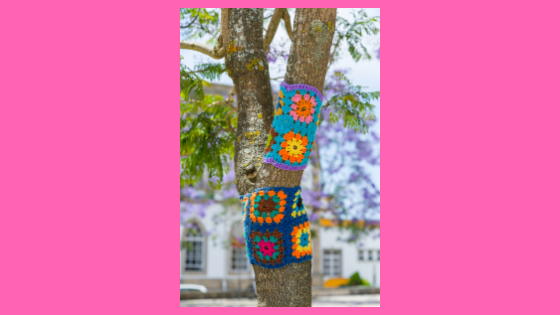 The closing page features Annabelle sitting happily in a tree covered in her own knitting. This opportunity for the library’s knitters was perfect. The interior of Centennial Library houses four full size artificial trees—exact replicas of native Texas foliage. 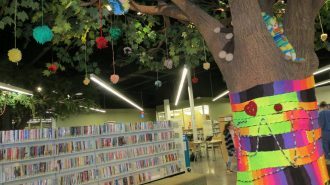 What better way to showcase Barnett’s picture book, our knitting program, and Project Literacy than to “yarn bomb” the library—especially the trees? Yarn bombing is similar to graffiti, only instead of using paint, participants use yarn. 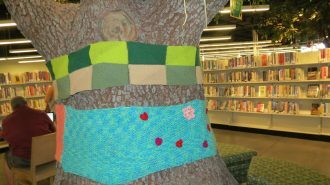 Local knitters and the library’s knitting group contributed scarves, shawls, Afghans, and pompoms to adorn the trunks, branches, and fixtures, in honor of Barnett’s visit to Midland schools and his book signing at the library. The yarn bombing also highlighted the joys of knitting and spirit of book’s heroine, Annabelle—demonstrating how creativity and generosity can connect and inspire.